Foot pain of any sort is always a problem, period. Since we cannot really avoid walking every day, solutions must be found. Unfortunately, putting your feet up for an entire day to escape the pain and allow recovery isn’t a luxury many people have. Most of us have to trudge through our daily routines in spite of the pain. When it comes to foot pain it’s best to avoid medication where possible. Luckily drug free pain relief solutions are widely available to help you. Promoting better circulation within the foot can provide great relief in the affected area. We took a close look at Revitive & Dr Ho’s circulation promoting devices. Use our comprehensive comparison of each including pros and cons to help make the best selection for your feet and begin enjoying your daily routines once again. Nine times out of ten foot pain is simply a symptom of poor circulation. There are many causes of poor circulation in human beings such as high cholesterol, high blood pressure, diabetes or addictive smoking. One of the most prevalent symptoms of health conditions related to these, will be foot pain. While the pain may feel isolated to the foot it’s often indicating unrest somewhere else in the body. Foot pain is usually a sign that blood and oxygen flow around the body is in short supply, which can lead to organ failure or damage. Since we use our feet every single day, foot pain can be both incredibly debilitating and inconvenient. Having to cover one’s foot with a shoe can aggravate the pain even further, which is why the devices below are such good news. Foot pain is generally not something that will heal itself over time, due to the nature of repetitive strain in day to day activities. In fact, it usually slowly gets worse. Properly stimulating circulation in the foot can result in better flow throughout the rest of the body. Foot pain should be addressed rather than ignored, as your discomfort is only likely to grow. Where possible, it’s always best to seek a drug free solution to a physical problem. All of this has the potential to eliminate bad circulation entirely, and the foot pain along with it. Attending regular sessions of reflexology is another drug free way of reducing foot related pain. Many people believe that reflexology is only a means of treating already existing conditions, however, this practice can be used as a preventative measure as well. You can also alleviate your foot pain from the comfort of your own home. Circulation promoting devices are widely available on the market for your convenience. These devices provide electrical nerve stimulation directly to each foot. The sensation is that of a pulse massage and can promote better circulation from heel to toe. The benefits of regular use of one of these devices can be felt in other areas of the body as well, not just the foot. That makes it an investment in your health, rather than simply an expense. There are many benefits to seeking a drug free solution to foot pain. At face value, the elimination of the pain might seem most advantageous. If you look deeper, however, you’ll find great beneficial effects on daily life. Drug free solutions to foot pain can help pull the entire human body back to a state of proper circulation. Your body will no longer be at risk for more serious conditions such as strokes or heart failure. Regular sessions of reflexology or use of a circulation promoter will release built up tension within the feet and lower legs. Muscles will heal faster than they did before. This will make your daily life will be easier. If this is what you’re in need of, our reviews will help you find the ideal solution relevant to your condition and budget. 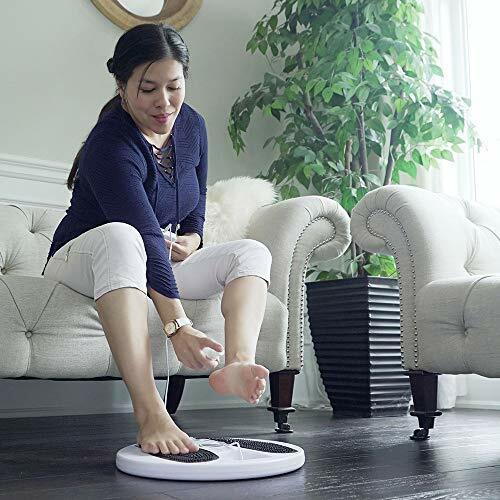 We love this unit from Dr Ho because it’s more than a simple foot circulation unit. This brand throws in an additional 26 massage pads for daily variation. 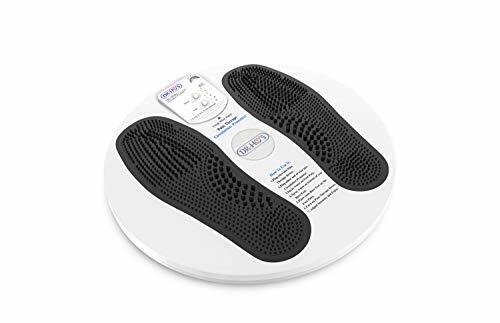 This is a great unit for anyone who experiences swelling in conjunction with their foot pain. The electric pulses on the Dr Ho are able to bring swelling down significantly. The unit is fully portable; You’ll be able to use it at home, at work or on the go. It even comes with a travel case for convenience and to protect it, ensuring it will serve you well for years. 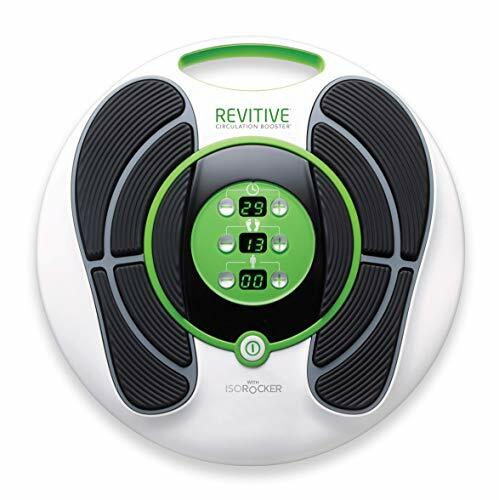 In spite of being the same price as the afore mentioned unit, this circulation booster by Revitive packs a lot more punch. The unit features an impressive 99 different intensity settings. Each one is specifically targeted around getting blood flowing better starting at the feet. The best part of the Revitive is that it’s built on a rocking mechanism. The device isn’t fixed to the floor, instead the user can self rock back and forth & increase stimulation in the legs and knees. Going drug free in your quest for pain relief can feel overwhelming, especially if medication has always been your go-to for pain in the past. 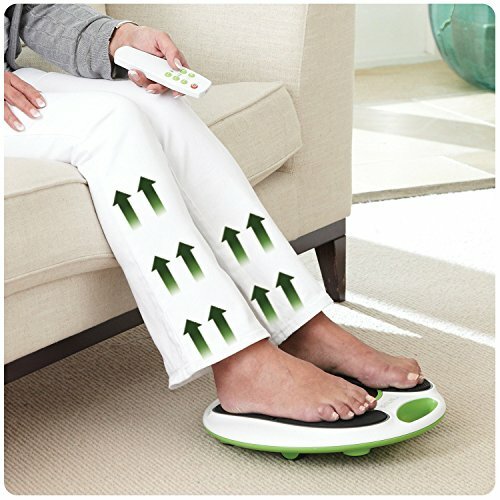 But know this: There is much to be gained from investing in a quality circulation boosting foot massager. Fit 30 to 60 minutes with one into your daily life and begin reaping the benefits today, without any side effects that so often accompany medications. Foot pain need not be tolerated for the rest of your days. There are simple solutions out there - why suffer any longer?